It all started with cardiovascular surgery. 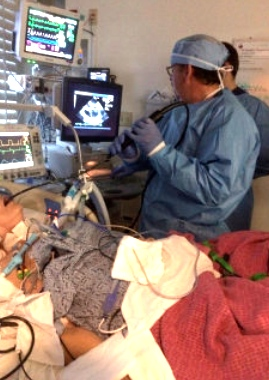 Surgeons, anesthesiologists and cardiologists alike realized that echo is a very useful method to monitor operations. This led to a chain reaction: echo is now used to guide an increasing number of procedures. This teaching post highlights such a procedure, but is also a beautiful example of the effects of teaching. Read on and find out more. It was 2010 when we finally went online with our platform. After months and months of hard work, we were curious to know whether what we put online would be of interest to the community. “Will someone actually sign up for course?” It was a slow start, but eventually some people did sign up. Early 2011 we had several loyal subscribers. Just so many that we still knew most of them by name. One of them was Neil Green, an anesthesiologist from Arizona. Initially we thought our course would only attract the Internet-savvy “young” generation of doctors, but Neil proved us wrong. He was 50+ at the time. We could tell from his mails that he was really enthusiastic about learning echo. Neil was confronted with a cluster of patients who became hemodynamically unstable during otherwise routine general anesthetic procedures. Obviously, echo was the best means of handling such situations. That was Neil's starting point in delving into the subject of echo. Within a short time he became an expert and was able to pass the United States National Board of Echocardiography TEE board certification exam with a score in the 93rd percentile. Neil performing a TEE study. Neil had started a training program on his own. As a matter of fact, he does something really practical: hands-on training using simulators. If you want to learn more on how simulators can help in medicine, read our teaching post “Can you do it?" What do you do with a patient who has atrial fibrillation but for some reason has a contraindication for anticoagulation treatment? 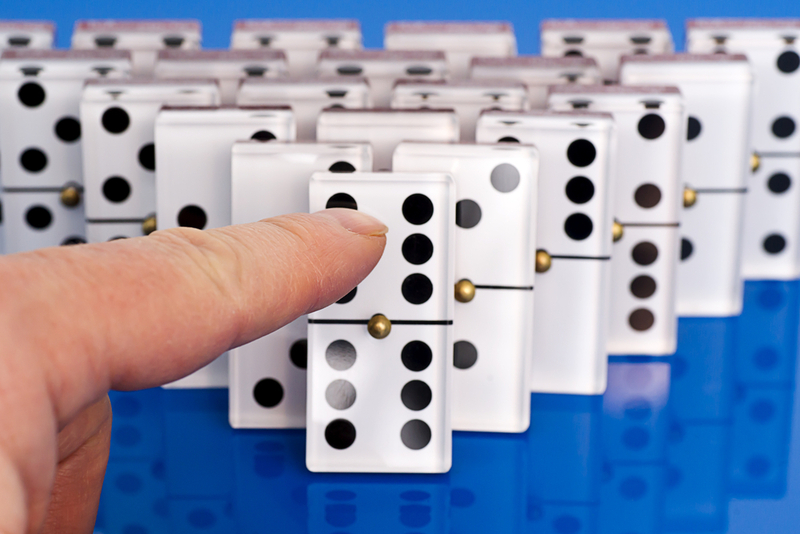 Should one simply live with a five-fold higher risk of stroke? The solution is quite simple once you know that most thrombi in the left atrium are formed in the left atrial appendage. Obviously, one must somehow abolish the left atrial appendage. Let us focus on the Lariat procedure - the only FDA-approved device for transcutaneous LAA occlusion in the United States. This is how it works. The Lariat procedure - animation. What role does echo play? First you need to visualize the left atrial appendage. It is best displayed with the probe at the level of the aortic valve in the upper part of the esophagus (30-90°). Then one measures the neck of the left atrial appendage. In this case it is 1.65 cm. Left atrial appendage – measurement. As the next step one performs a puncture in the interatrial septum. 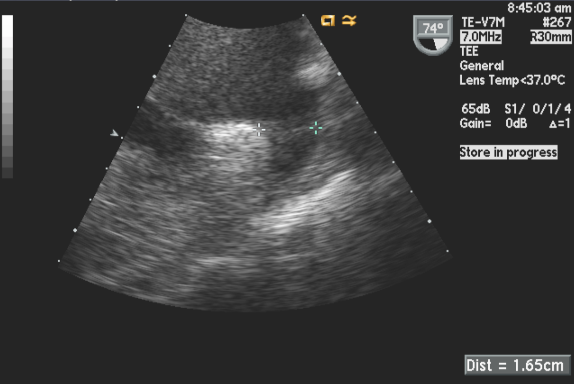 The following video shows “tenting” of the interatrial septum caused by the needle that pushes the interatrial septum to the left. One can clearly see the moment when the needle pierces the septum. Tenting of the interatrial septum - Transseptal puncture. Transseptal puncture is performed quite frequently in ablation (i.e. atrial fibrillation), valvuloplasty, or MitralClip procedures. It is not free of complications, as you can imagine. The aorta is rather close to the interatrial septum and the wall of the left atrium is quite thin. You must be really sure you know where you are when you push the needle. This is exactly the added benefit of echo. As opposed to fluoroscopy, you actually see the interatrial septum and its relation to the puncture needle. A catheter with a cylindrical magnet is passed up the IVC into the right atrium and transseptally to the distal tip of the LAA. the wire is placed in the left atrial appendage. At this point a second catheter is passed in the subxiphoid aspect into the pericardium. This catheter also has a magnet at its tip. A lasso suture (Lariat) is passed over the subxiphoid wire. The suture is cinched down and cut, and thus ties off the appendage. Once the left Lariat is in place, the left atrial appendage is sealed off and is no longer visible. The left atrial appendage is now “excluded”. Color Doppler and contrast may then be used to check the outcome of the procedure. There is no flow between the left atrium and the left atrial appendage. The left atrial appendage is completely sealed off. Like other procedures to occlude a left atrial appendage, the Lariat procedure can be performed with an acceptable rate of periprocedural and short-term complications. It is still too early to judge the effects of this approach on stroke and patient survival, but we expect to see more of these procedures in the future. Echo can be used in many ways. I am sure its applications will expand further as new procedures evolve. Learning echo is most certainly worthwhile. It helped Neil and I am sure it will also help you. Maybe you will also become a teacher at some point. You can start right away by sharing your knowledge with others - and by forwarding this teaching case to your friends. Neil Green is a general anesthesiologist from Arizona and founder of Echosim, a hands-on training program for TTE and TEE. PS: Follow Neils example. Learn echo from us and you might soon be the one who teaches others too.